Could I get a translation for this, please? "I'm good, even though I'm not able to call that much. We get cold weather here, how about your place?" I am requesting a translation of a letter I'm writing to Berryz kobo to be given to them @ Sakura-con. let me know and I'l pm you the letter. I didn't notice this, but do you still need it translated? Last time I checked I had level 1 but I don't know how I'm supposed to level up beyond that, at leas the way I thought it should doesn't seem to be it. Usually [?we?] don't have a chance to see [?each other?] but when [?we?] do [?I?] want to talk about a lot of things. 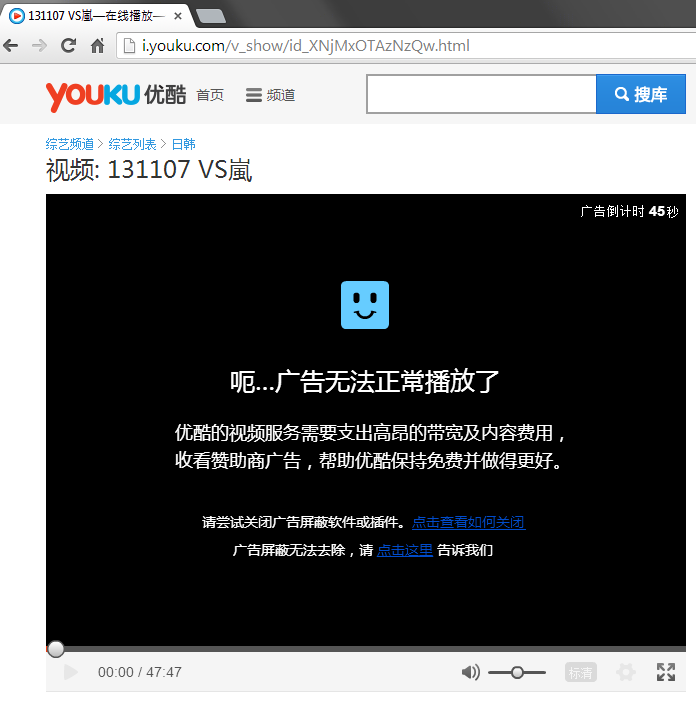 So I've been getting the following message more and more often over the last couple of weeks when I try to watch videos on Youku. Can anyone translate/summarize what it says? Also, has anyone else been getting this? There doesn't seem to be any pattern or anything, just happens at random times to random videos. Sometimes the number in the upper-right corner counts down, other times it doesn't. Sometimes refreshing the window/tab gets the video to play, other times it doesn't. Sometimes the video will play if I try it again after a period of time, while other videos just keep giving me that screen. I have a T-shirt that has 名のつてる (at least that's what I think it is) written on the upper left corner. I was wondering if this means anything or it's just some random gibberish. If the Japanese characters aren't clear enough, I can try to take a picture of my shirt to get a better idea of what the text looks like. @JFC: it says that the ads can't run properly, so either turn off the ad blocker or just refresh. Kinda like how jp sow their name tag on sport shirts for PE. I guess the vague Google translation that I got wasn't too far off then (it also translated to about what you posted). I just wasn't too sure if it was that simple or not. Now that you mentioned the gym shirts with the names on them, I guess that shirt I have is probably like that.